An article on the Bulleid Double Deckers: "Double trouble ... or double the fun?" by Stephen Nash. Heritage Railway, October 2005, pages 80-83. Work continues on the DD and EPB units when time permits. Efforts are concentrated on the NIRT. the Mid Norfolk Railway for their help in the move. EPB 5176 was visited on the 22nd July by Kevin Smith, Bill Nile and Terry Brand. A visual exterior and interior inspection was carried out and the vehicles we have been allocated are all in very good condition. The paintwork is in need of a heavy handbash and the interior requires only a heavy clean. There is some corrosion damage but it is considered managable. 1 set of shoegear is missing but is not considered essential at the moment. On the TSO there is is roof leak which when on arrival at Hunsbury will be rewelded to make the unit watertight. All in all the Unit has been very well looked after. The brake and cab areas will be repainted internally and this will be done by Terry Brand, a newly aquired fan of the third rail, he is a South Londoner who now knows his SUBS from his PULS. The BDDS welcomes 5176 in joining shedmate 13004 of 4002 to the fold. 5176 will be reformed in to the following formation: DMBOS 14351 TSO 15396 DMBOS 14352. The TSO 15354 is to be added to 4 SUB 4732 at Coventry. For further info on this vehicle please contact SERA at Coventry. 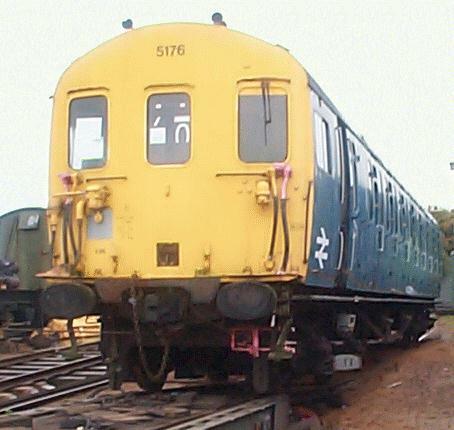 EPB unit 5176 currently residing at the Mid-Norfolk Railway owned by Bulleid Electric Limited and which was under threat of the cutters torch is now safe. In a deal that has been negotiated with the group, 2 driving ends and a trailer car have been handed over to the Bulleid Double Decker Society based at the Northamptonshire Ironstone Railway Trust. The society is to renamed as Bulleid Preservation Enterprises and is a merger of the groups. We are grateful to Mid-Norfolk Railway, Howard Johnstone & Mark Bowman for their help in negotiating this handover. The 1st coach will be arriving subject to confirmation in mid August. BBC TV (South East News) have filmed the unit as part of item on the possible re-introduction of double deck trains. The broadcast date has yet to be announced. The DD - the old gel has been left idle again - we are still busy trying to get NIRT up and running before we leave them to their own devices for a while. The Trust now has the biggest collection SR vehicles on site only SERA beat us in this score. 1 CEP TSO has been aquired by members of the Trust and was used in the Forthcoming UK Film The Fourth Angel. 1 BIG Buffet Coach was aquired again from Cotswold and owned by a member and is now being fitted out as the NIRT Kitchen and Hospitality Centre for Groups and Visitors. Not alot going on at the moment. We have had to concentrate getting Hunsbury up to scratch for passenger services etc. for the spring and summer, however - the drivers side cab door has been reskinned and refitted, the electrical work on 'A' compartment is progessing and we as the restoration team - Bill, Nick, Andris, Ivor & myself will be going hammer and tongs when the spring appears on getting the crewing areas, and 'A' compartment sealed up and fit for passenger use. A compartment will also be the showroom of the DD. Work on the "beast" is continuing well. The first compartment is being rewired and the back end has been made completely watertight. We aim, and I stress aim, to have the 1st compartment & brake van in a state where retrimming etc. can restart in about 5 months time.